Last night I made Iowa Girl Eats Mozzarella Stuffed Bruchetta Burgers, and they were amazing! You basically stuff shredded mozzareall cheese into the middle of two patties, seal up the ends, and then grill. The cheese was nice and melty inside, and then to top it off with fresh bruchetta and a tnagy balsamic glaze...it was a-maz-ing! I made two burgers and mixed up 1/4 of ground turkey and 1/4 of ground chicken. I was trying to use up the little odds and ends meat in my freezer, but you could probably use any kind of ground meat. I think the ground turkey goes very nicely with the spices in the recipe though. The only thing I would change is that I might use more italian seasoning. I ended up using dried oregano (IGE's recipe calls for dried basil), and I think I would double the dried spices, but maybe my dried oregano just wasn't cutting it for me, so I would like to try it again with an italian blend of spices...mix it up! 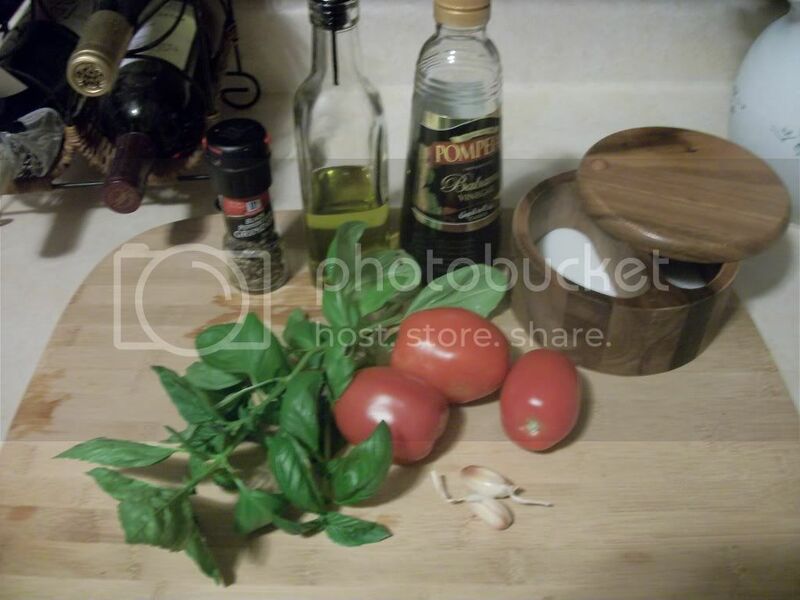 Chop tomatoes, and basil and then mix all ingredients together. Place in the refrigerator for at least 30 mins so everything blends together. 1. In a large bowl combine ground turkey/chicken, salt, pepper, basil and parmesan cheese. Divide mixture into 4 portions. 2. IGE's has a cool trick to line a peanut butter jar lid with foil, then plastic wrap and press 1 portion of the turkey mixture into the lid to help shape your burger, but I didn't have a lid, so I just hand shaped them. 3. Heap 1/4 cup mozzarella cheese into the middle of 1 portion, then top with another portion. Press down to seal, then invert the patty onto a plate. Continue to make 2nd burger patty. 4. 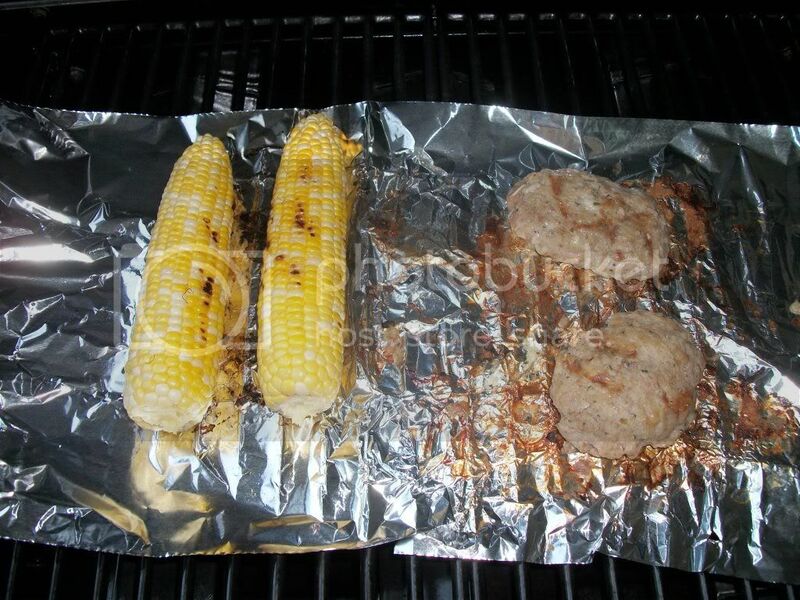 Grill burgers for 3 to 3 1/2 minutes per side over medium heat. 5. For Balsamic Glaze: heat balsamic vinegar in a sauce pan over medium heat. Let simmer, and stir frequently, until the vinegar has reached the consistency of thin maple syrup. 6. Top grilled burgers with Bruschetta mixture and drizzle with balsamic glaze. 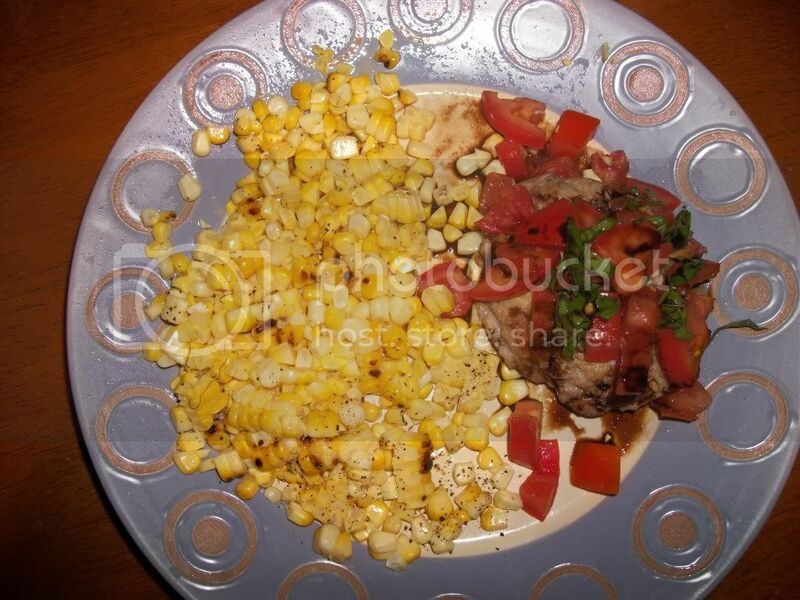 It was great with a side of grilled corn! Sounds delicious! Thanks for stopping by my blog from Mingle Monday. Looking forward to following yours! yummy! this looks delicious! Stopping by from Mingle Monday!